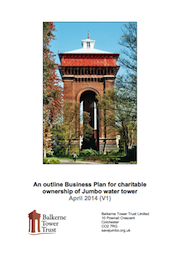 BTT has a carefully scheduled and costed plan to restore Jumbo and make it a national heritage attraction celebrating the birth of modern water supply nationally and locally, as well as a viewing platform. After five years we would aim to have Jumbo functioning as a viable heritage attraction, taking its rightful place alongside Colchester’s other historic attractions. For more information about our aims please see our Manifesto and watch our short video. To see our Business Plan, please click on the image opposite.